Visit some of the most beautiful parts of Western Sicily with this day trip from Palermo to Erice, Segesta, Nubia and the Trapani Salt Pans. 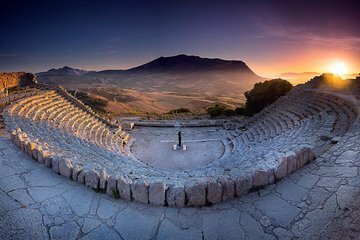 Visit an archaeological excavation at Segesta. Take in the excellent views from the hilltop town of Erice. See how sea salt is still collected off the Sicilian coast at the Salt Pans of Trapani. Abbiamo passato una giornata splendida! Il nostro accompagnatore - puntualissimo- è venuto a prenderci sotto casa, abbiamo poi raggiunto gli altri partecipanti in tutto eravamo in 5 e siamo partiti per Segesta. Il nostro autista accompagnatore, persona squisita, durante il tragitto ha risposto a tutte le nostre richieste e ci ha dato tante notizie sul territorio. Si è creato da subito un bellissimo clima fra di noi! Dopo Segesta abbiamo raggiunto le saline di Trapani e dopo una sosta in cui abbiamo anche raccolto un po' di sale per ricordo, ci siamo inerpicati fino a Erice in un'atmosfera magica, grazie ad una improvvisa nebbia - poi diradatasi-, che ha reso la visita particolarmente suggestiva e indimenticabile. Il nostro accompagnatore, fuori programma, ci ha portati anche ad ammirare il panorama mozzafiato da un'altura sopra Castellamare del Golfo e, siccome era il giorno di Pasqua, per festeggiare con una nota dolce, ci siamo fermati anche a gustare le cassatelle appena fatte in una pasticceria locale. Siamo tornati a Palermo in un'atmosfera di grande cordialità e simpatia. Bellissima giornata! Vivamente consigliato. Excellent tour from Palermo to see the Segesta ruins and Erice. Wish the Erice stay was longer, although there was enough time to have a sit-down lunch and walk through and shop. If you ask me, the salt pan trip was unnecessary----just have a good visit to Segesta in the morning, and a longer stay in Erice, since there's more to see, do, and eat there. Nevertheless, a great value for money as a day trip from Palermo. The visit to Segesta was great and the temple and ruins were well worth seeing. On the other hand, where were the Salt Pans. If it is not the right season, don't offer the tour and then disappoint the paying clients. Erice was interesting, but having visited my share of medieval villages, this was only average. The visit to Segeste and Erice was great. In contrast, the visit to the salt pans was interesting, but not worth the drive to the place. Our tour leader was Michael and he provided us with an excellent background of the history of the places we visited. The Salt Pans aren't really worth the effort to see but Segesta and Erice were fantastic. Michael was our driver/guide and he was very professional and knowledgeable. It was a small group and we quickly became friends. It's a nice way to spend the day outside the madness that can be Palermo. Driver on time to pick us up. Very pleasant and helpful. Good driver. Van comfortable. Small group. Surprised that we had to pay for our own entrances and that there was no guide. We paid about 50 each which was expensive. In other countries we have had guides with us as well as a driver! Reluctant to purchase another trip because of lack of a guide. I enjoyed this trip mid October 2017 very much. We were a small group in a van rather than a large group in a bus. This made the trip much more enjoyable. Michael, our tour guide, was knowledgeable, courteous and professional. He explained everything we needed to know about Segesta, the salt pans at Trapani ,and Erice in order to thoroughly enjoy the experience. His command of Italian, Spanish, and English is excellent. He also ensured that we could take some great photos by briefly stopping. I highly recommend this trip....especially with Michael. We liked very much this tour.This is a tour that takes you to different places and give you the freedom to look at them by yourself. Our guide was great,very nice and an excellent driver. We recommend this tour to people who likes to be independent when they travel. Michael was very knowledgeable and friendly, and gave us tips before leaving us off in the various towns. We especially enjoyed Erice and its arancini. Try the one just after the gate on the left, unfortunately, they were out of Nutella ones but the ragù and also the spinach and mozzarella were very tasty! Muy recomendable la excursión para conocer el oeste de Sicilia. Segesta es muy bonito, pero es cierto que si ya se ha visitado el Valle de los Templos, se queda corto....Nosotros es lo primero que vimos y nos impresionó. Erice me enamoró. Tiene unas vistas impresionantes . La pega del viaje, para mí, son las salinas.... esperaba mucho más, pero ya es problema mio y es cierto que pilla de paso para visitar Erice. Es una visita rápida y no se pierde tiempo. El guía fue maravilloso en todo momento, muchos detalles y nos solucionó cualquier duda que pudimos tener, tanto de la visita como recomendaciones del resto de Sicilia.